A helicopter carrying 12 people, including seven police officers, a judge, a sergeant and three crew members, has crashed in Turkey's eastern Tunceli province. Tunceli Governor Osman Kaymak announced that there were no survivors of the crash, and that the bodies of the passengers and crew members were found by thre rescue crews. Military helicopters landed at crash site and rescue crews reached the helicopter wreckage after battling with poor weather conditions for almost four hours. 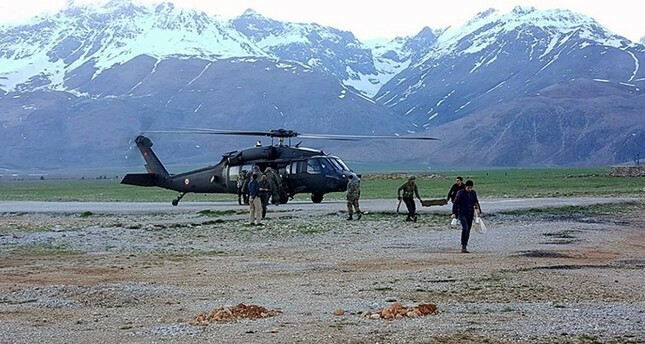 A military unit and a 42-person team from the Prime Ministry Disaster and Emergency Management Authority (AFAD) were immediately dispatched to the area between Pülümür and Ovacık districts for search and rescue operations. The Tunceli Governorate said in a statement that authorities lost signal of the helicopter, which took off at around 11:40 a.m. from Tunceli's Pülümür district. The governorate added that bad weather conditions are being considered as a possible cause for the crash. A crew member of the Sikorsky S-70 Blackhawk helicopter called the emergency service after the crash and reported seven injured people, media sources said. The crash comes as Turkey has been facing heavy rainfall and fog across the country. Sikorsky-type helicopters are widely used by Turkish ground and naval forces, in addition to the gendarmerie and police departments. Some 22 accidents, including forced landings and shootings, have been reported by the Turkish Armed Forces (TSK) since 1994. A total of 124 soldiers and civilians have been killed, while 65 others have been injured in these accidents. Even though the number of accidents seems high, Sikorsky-type helicopters have been used in Turkey for 26 years and constitute the main portion of the TSK helicopter wing.